Erin O’Shea, an internationally renowned cell and systems biologist, will be joining MCB. Erin is currently an investigator of the Howard Hughes Medical Institute at the University of California at San Francisco, and will be joining the Harvard faculty in the summer of 2005. Erin hails from upstate New York and received her undergraduate degree from Smith College. She did her graduate work at MIT, working with Peter Kim. Her thesis was spectacular, showing how leucine zipper transcription factors dimerized in order to bind to their recognition sites on DNA molecules. 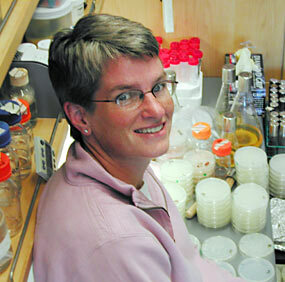 She then did a brief post-doc at UC Berkeley before joining the faculty of UCSF in 1993, where she began to work on the regulation of gene expression in budding yeast. Her comprehensive analysis of how phosphate levels in the environment control gene expression has produced many important findings. These include the first demonstration that cyclin-Cdk complexes controlled processes outside the cell cycle, the demonstration that multiple phosphorylation sites could independently regulate different aspects of a transcription factor’s behavior, and the realization that the careful control of these phosphorylations allows cells to produce a qualitatively and quantitatively different response to differing levels of phosphate starvation. These last experiments are an example of systems biology, the combination of quantitative measurements with mathematical modeling that seeks to explain how individual properties of cells arise out of the interactions of their component parts. Erin looks forward to participating in the development of systems biology at Harvard, where she is expected to play a major role in building a new community of scientists that includes both the Faculty of Arts and Sciences and the Department of Systems Biology at Harvard Medical School. In collaboration with her colleague Jonathan Weissman, Erin has launched a systematic study of the proteins encoded in the budding yeast genome. By tagging every protein with either a fluorescent protein or an affinity tag, they have made it possible to look at the localization, amount, and binding partners of all proteins. These collections are valuable resources for the budding yeast community and open up many new kinds of experiments. Erin’s work has been widely recognized, and she was recently elected to the National Academy of Sciences and the American Academy of Arts and Sciences. Fluorescence micrograph of diploid budding yeast cells expressing two different fluorescent proteins under the control of the same promoter. Gene expression is “noisy” – some cells express more of the red fluorescent protein while others express more of the green one. Courtesy of Erin O’Shea.